ICAS President Sandy Manson recognises this as a 'period of disruption' for the profession. Brexit, the change to major audit tenders and a debate over the future role of the FRC could well be defining moments in the year ahead. Reinforcing the value of the CA brand and ensuring that the CA qualification reflects the evolving needs of CAs both today and tomorrow is vital. Sandy Manson argues that the challenges facing CAs can be a springboard for those who aspire to the highest standards of the profession. Had it not been for the fact that I was inspired by accountancy in my final year at school, I would now be following generations before me in farming the soil of Aberdeenshire – instead of writing my first President’s column as successor to the exceptionally talented Sir Brian Souter. However it was my CA qualification that provided the best possible springboard to a career in the profession and opened up a world of opportunities. It is therefore with an enormous sense of honour that I become ICAS President. To do so at a period of such significant change, opportunity and challenge makes the role all the more fascinating and compelling. This is an era of disruption for our profession. However, opportunities abound provided we keep successfully adapting and changing in the face of this dynamic landscape. In a world where public trust in business has been badly shaken, I believe combining the highest level of financial and commercial acumen with a strong ethical code are timeless fundamentals. Such skills and virtues lie at the very heart of ICAS and form the “DNA” of Chartered Accountants. Our members in practice are seeing a great deal of change, not least due to the advent of Making Tax Digital, but also as a result of the pace of technology and regulatory change. I want to ensure ICAS proactively supports our member firms of all shapes and sizes to successfully meet these challenges and take advantage of the clear opportunities that lie ahead. The year ahead may be one of defining moments and not simply because of Brexit. 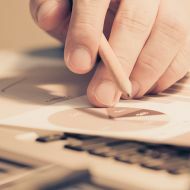 The recent announcement that some of the larger national firms will no longer tender for major audits came just as our regulator, the Financial Reporting Council, said it was time to look again at competition in the sector. A debate over the future role of the FRC is also coming to a head. We will play an active part in ensuring these debates have balance and keep the public interest to the fore. As the profession comes under increasing scrutiny, I also believe we must be on the front foot in extolling the virtues of the work our 21,000 members do and the significant contribution they make to economies and communities around the world. So many of our members are trusted and transformational leaders in their communities. I particularly enjoy it when people tell me about the respect they have for CAs. However, we can’t rest on our laurels. We need to ensure that the CA qualification reflects the evolving needs of CAs both today and tomorrow. We all have a role to play in reinforcing the value of the CA brand. It’s the daily actions of each one of us that shapes and defines the CA brand. That’s why it’s all the more important that we robustly tackle behaviours which undermine what we stand for. We all have a role to play in reinforcing the value of the CA brand. Underpinning ICAS is our unique education programme and the importance and emphasis placed on values and ethics. If we are to build a lasting trust with the public then we must be tireless in our pursuit of promoting and following strong ethical practice. In short, if we don’t lead the way and help business to behave responsibly then Governments may decide to do it for us. As someone who has benefited from the wisdom and foresight of previous generations on both a professional and personal basis, I believe strongly in building a valuable legacy for those that follow. As your president I see my task in the year ahead as a simple one – to look after ICAS and leave it in an even better place 12 months from now. I very much look forward to doing that with energy and pride.